You will see 5 main sections where concentrated global options for Boombox Theme header. Let’s see what yo can change and control under these sections. is the options which show the way how you can organize header components. 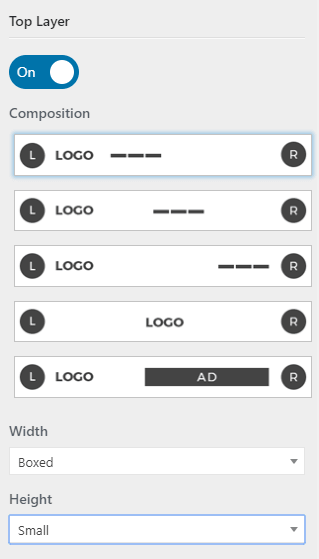 What you need to know is that you can have components on Left side which is L and on Right side which is R. Pay attention as well to Logo Position, Menu position and Ad. To find out how to upload Logo please read this article. After selecting Top Layer and Bottom Layer structure you can manage what components to set on top and bottom layers. For admins convenience we have created Components Position in a way which is extremely easy to use and organize. Just drag and drop Unused Components which are in the middle in Top Layer Components L or R area on top or drag and drop in Bottom Layer Components L or R area at the bottom. 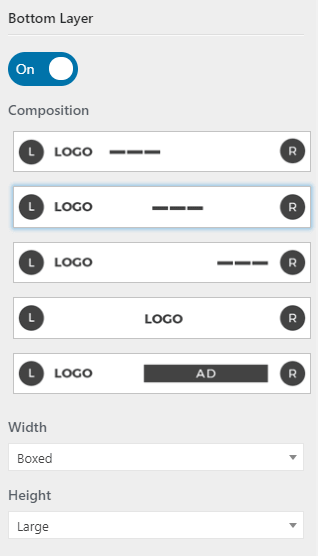 From this menu set Badges Menu location Outside Header (Top Layer and Bottom Layer) or Inside Header or set as None. 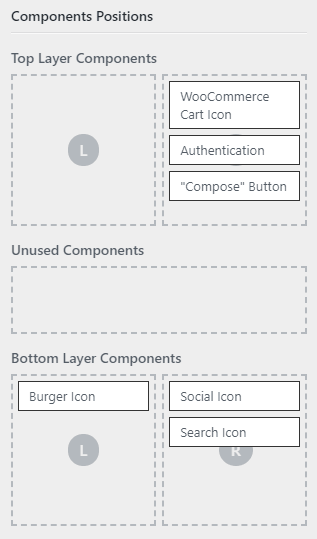 When Inside Header selected then Badges Menu appears in Unused Components, thus admin can set location of Badges menu from Components Position in Top Layer or Bottom Layer . When Badges Menu location set as None that means that Badges menu will be hidden from Header. In Boombox you can extend header and especially menu functionality by adding More Button which have pop-out menu with options to include many components. You can control position to set After Top Menu or Bottom Menu. You can add or remove elements in More button menu from Menus. This text is visible under the more button, just type in desirable text or leave blank. Choose which layer will be Sticky, Top Layer or Bottom Layer, or Both or None of the layers. This icon can be On or Off with trigger. This unique feature allow to use extra location for showing one of the existing menus. 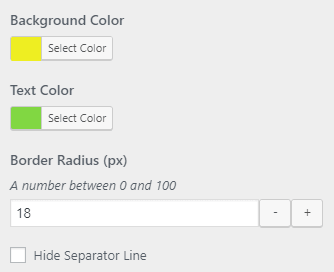 Go to WordPress Customizer ▸ Design ▸ Header ▸ Featured Labels and first of all you need to set Visibility of the Posts Strip. Posts Strip is a place where you can collect all the recent posts on top of the posts and pages. This is global option and this will affect everywhere on site. Despite that you can control Posts Strip on Archive pages, Specific Page and On global Single Posts. 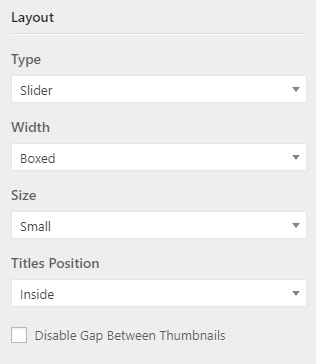 Go to WordPress Customizer ▸ Design ▸ Header ▸ Posts Strip and first of all you need to set Visibility of the Posts Strip. 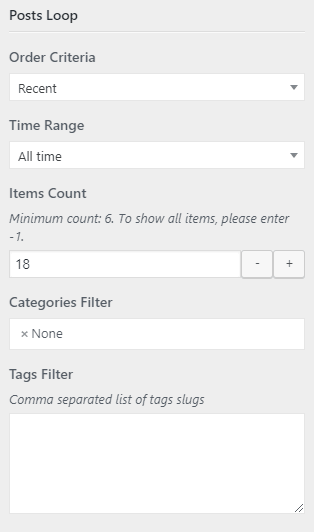 Please note, that if you want to have different Posts Strips on Archive or Single Posts then you need to keep the checkbox for Visibility marked. Archive – Go to WordPress Customizer ▸ Archive ▸ Posts Strips and change the dropdown value from Inherit to Custom. Single Post – Go to WordPress Customizer ▸ Single Post ▸ Posts Strips and change the dropdown value from Inherit to Custom. In case if Custom selected you can change font for selected elements.